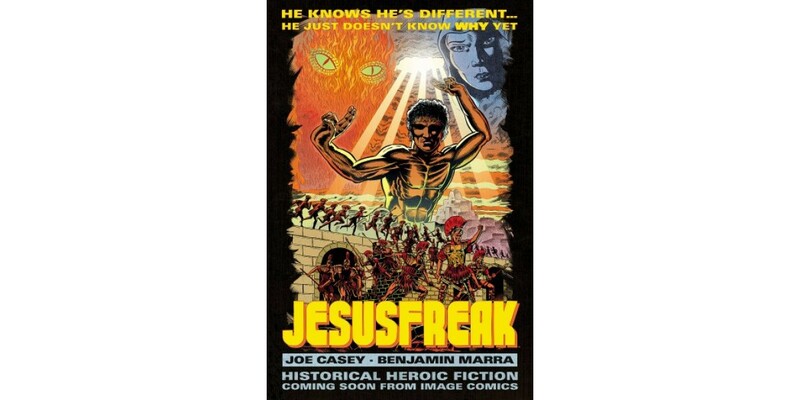 Next spring, Image Comics presents JESUSFREAK, an all new, never-before-published and sure-to-be-controversial original graphic novel by writer Joe Casey and artist Benjamin Marra. JESUSFREAK is a bloody, two-fisted tale of heroic historical fiction featuring a certain young Nazarean carpenter who is having some trouble finding his place within a world of ever increasing violence. He knows he’s different… he just doesn’t know why. Image Comics will publish the original graphic novel as a 64-page, full color hardcover retailing for $17.99 in comic book stores on March 20, 2019 and in bookstores on March 26, 2019. An exclusive 16-page black and white ashcan preview of JESUSFREAK, featuring a two color cover, will be available for purchase for $1.00 at the Image Comics booth (# 1444) at New York Comic Con. Joe Casey and Benjamin Marra will attend the convention, which will be held at the Javits Center in New York City from Thursday, October 4th through Sunday, October 7. JESUSFREAK (ISBN: 978-1534311749) can be ordered on Amazon, Barnes & Noble, Books-a-Million, IndieBound, and Indigo.